Why HAM radio? Because it’s fun, interesting, challenging and a public service during time of emergency. HAM operators make new friends across town and the world. Amateur Radio is one of only two hobbies that require a government license – the other is to be a Private Pilot. Now, there is no need to learn Morse Code or the technical details of how computers and radios work to earn an FCC license. 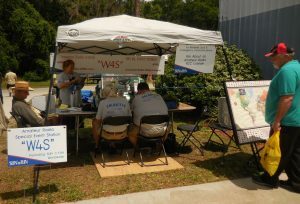 If you have an interest in science and technology, “rag chewing” or making new friends, stop at the amateur (HAM) radio special event radio station, W4S, as you leave the museum. The station is located outside the North door in the shade tent below the tower and tribander beam antenna. See how amateur radio works and visit with the operators to learn more about getting an FCC license and amateur radio as a hobby and public service. If you are already a licensed HAM radio operator be sure to sign the visitors log. Better yet, spend some time as a volunteer operator making and logging contacts with stations in other cities, states and countries. 22 Things You Can Do With Amateur Radio & Serving Your Community! Be sure to visit the Aerospace Discovery at the Florida Air Museum to see and learn about aircraft, rockets, technology, airlines, personalities and events that have shaped aerospace as we know it today.